Profile of ZigZag Ambi shown positioned over suggested stick diagram. The part of the Stick Rule concerning dimension as it was written in 1990 and as it last appeared correctly in the Rules of Hockey in 2003.
d. the total weight shall not exceed 737 grammes. The current description of permitted protrusions to the edges of the handle. 2.4. 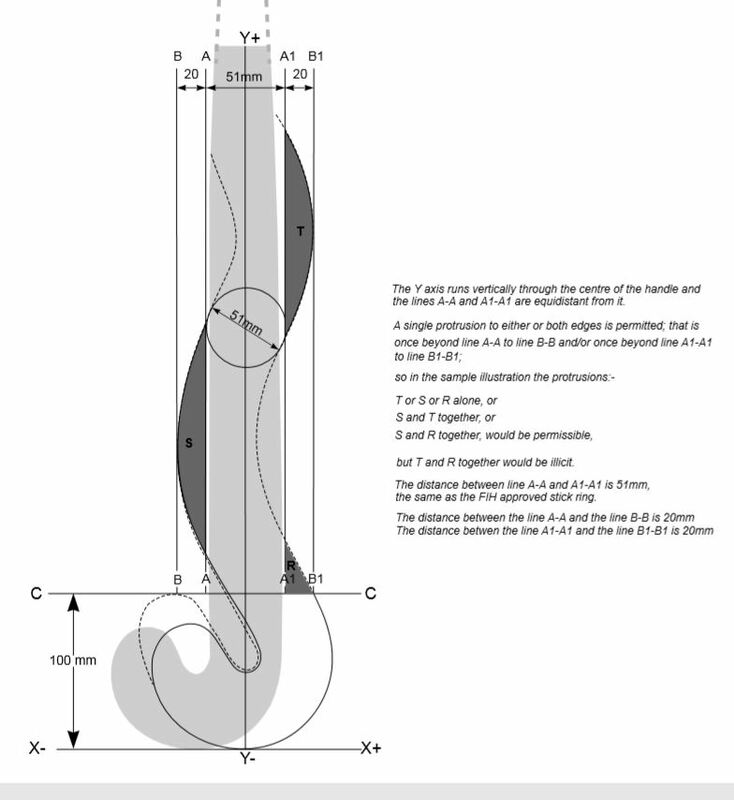 It is permitted for the handle to be bent or curved to protrude beyond the line A once only to the limiting line B at maximum or but not also to be bent or curved to protrude beyond the line A1 once only to the limiting line B1 at maximum. I have no idea why the change was made, I believe it to have been a mistake in transcription, made in 2004, when all technical specifications concerning equipment were removed from the Rules of Hockey and published in a separate booklet. Technical specifications for equipment were returned to the Rules of Hockey in 2006 and the mistake has been repeated in all rule books published since then. My repeated writing to the FIH HRB to have this corrected have got nowhere. The current diagrams makes a very good job of concealing the configuration and dimensions of the edge protrusions that they are supposed to be illustrating. The bends shown on the diagram on the left below go in the opposite direction to the way the bends on my design go because the FIH did not want to be seen to be endorsing any particular brand while illustrating the scope of the permitted bends. The diagram on the right is taken from one I submitted to the FIH HRB but dotted lines, which I included to show the overlap of the two heads illustrated (a sample maximum possible set-back head and a conventional hook) were not included, so the difference between the conventional and the extreme permitted is not as clear as it could be. (The ZigZag Ambi, at about half the measurement that is permitted, is not close to the possible extreme configuration – see diagrams above and below). 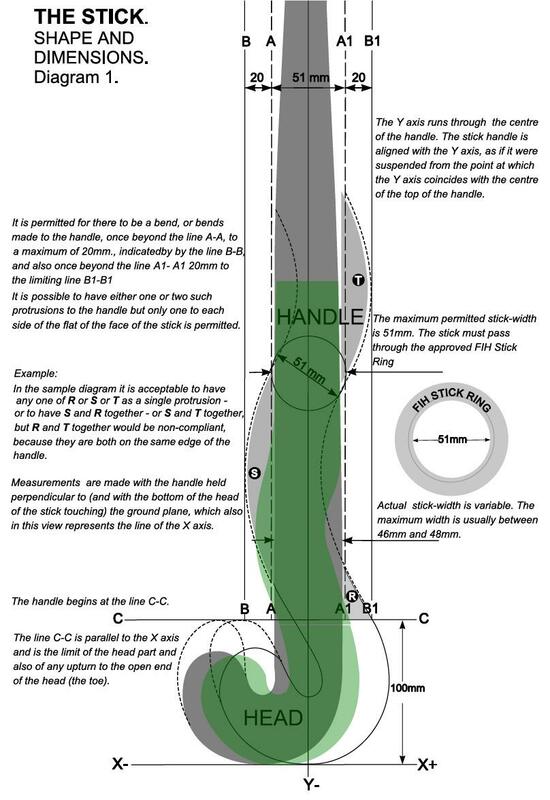 A replacement diagram of the face side of the stick with the corrected Rule text set out within it and with an illustrated explanation of the permitted combinations of bends or protrusions to edges of the stick handle. This diagram has been in the possession of the FIH HRB/ Rules Committee for more than ten years. 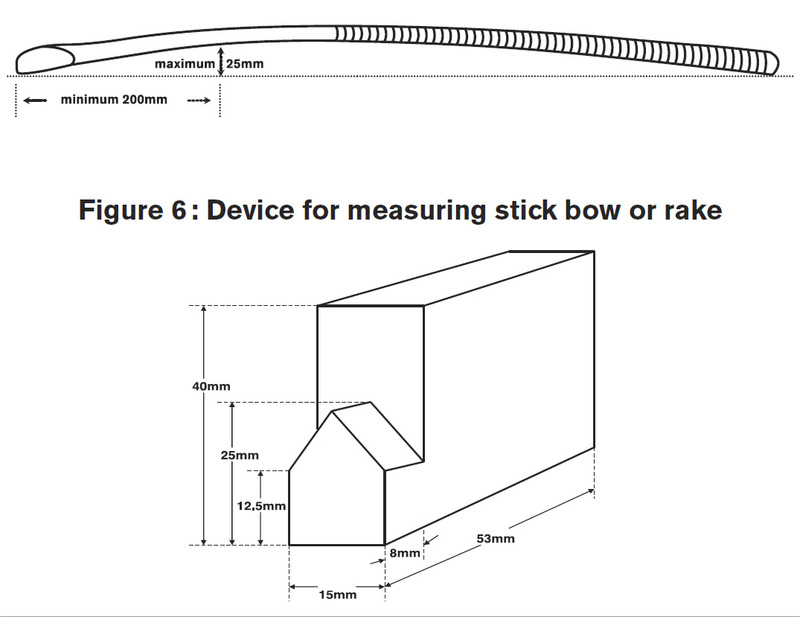 Permitted stick bow dimensions and diagram. I have not even seen a bow measuring device, only a diagram of one and I don’t know of anyone who owns one, so it is difficult to comment about it, other than to say it seems to be a very complicated shape to carry out a simple task that could be done with a cylinder or tube with an OD of 25mm. The only other equipment needed is a flat surface (an ironing board would provide a suitable flat surface pitch-side, such tables are easily portable and quick to set up), a short ruler or set square and a tape measure. When the former Secretary of the FIH Rules Committee, Roger Webb, asked for my opinion concerning degree and position of stick bow, I suggested 25mm as a maximum and, foreseeing the possibility of what came to be known as the ‘low bow’ and the safety issue with accidentally raised hits, that the position of maximum bow should be no more than 200mm from the mid-point of the length of the stick and preferably within 150mm. The bow that was then permitted was 50mm and there was initially no restriction placed on the position of maximum bow. When maximum bow was, very quickly, reduced to 25mm, the low-bow stick appeared (and was heavily promoted as a drag-flick stick). The 25mm low-bow presented the face of the stick to the ball at about the same angle as a stick with a 50mm bow at the mid-point did – so then the position of maximum bow on the stick was regulated, it is now to be a minimum of 200mm up the handle from the base of the stick-head, which puts it at between 325mm and 350mm from the mid-point of the length of a stick, depending on the length of the stick: almost twice what I suggested, but there is at least some regulation. I later suggested that as the modern composite stick does not have a splice joining handle to head and even in wooden sticks this is an economic measure rather than a necessity, that the distinction between head and handle should be on a line level with the maximum permitted upturn to the toe of the head, 100mm from the ground or the base of the head of the stick. That suggestion was accepted. Concerning Bow (not rake, rake is a bend to the heel edge of the stick, not the face of the stick) – none, it is now too late, manufactures would need to be given several years notice of a more severe restriction. The overlay on the suggested diagram is a representation of the configuration of the ZigZag Ambi. 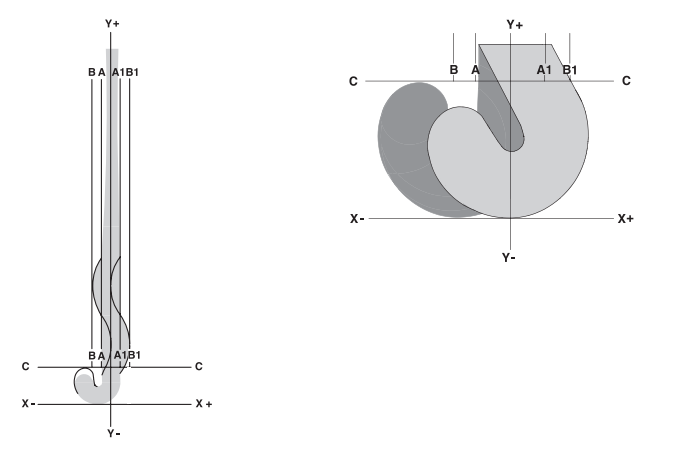 The protrusions to the edge sides of the Ambi are about half the width of what is permitted. In setting the maximum permitted protrusions 20mm was added to the width permitted by the limiting diameter of the FIH Stick Ring, to allow for goalkeeping sticks already in existence at the time which had an edge protrusion of about that much just below the handle grip (it being considered unacceptable to outlaw sticks which had been on the market for some years at the time). The head of the stick, the part below the line C-C is not limited along the X axis and can therefore protrude considerably more than 20mm on the heel side as well as the toe side, but such a protrusion would be a handicap rather than of benefit in a stick intended for use by a field player. The set-back of the Ambi is determined by the degree of set-back possible before adjustment needs to made for it by a player when a push stroke is played. An extreme set-back (maximum permitted) tends to snag on the ground during a push stroke and must be adjusted for. The slightly set back head achieved a better head shape for ball control than the previous ultra tight heel bend and also, with the use of lamination and the incorporation of a kink to the shaft above the toe upturn, overcame the problems of bending wood – which, when the stick was designed, in 1985 and until 1992, was the only material that a stick head could be made with. The configuration shown is circa 1987. Later versions (developed after 2006, but not marketed) had a more extended toe (90mm). The goalkeeper sticks (Save and Reach, first produced in 1990 and 1992 respectively) always had a toe up-turned to the 100mm maximum permitted. I have recently made other modification to the top of the handle, which I have not published. I very much doubt that this handle modification will be marketed but I still enjoy designing things and trying to improve the using of what we have. Below an earlier, simpler version, of a suggested stick diagram.